Above is my favorite spread from Jennifer Berne’s On a Beam of Light: A Story of Albert Einstein, illustrated by Vladimir Radunksy, which will be released by Chronicle Books in April. (You gotta click on the image itself to enlarge this one so that you can really take it in and appreciate the color and scope.) Note the subtitle and how it clearly tells readers this isn’t your typical picture book biography. It’s “a story” of this remarkable man’s life. The book does, in fact, begin with his birth over a hundred years ago (this past week marked his birthday — on the 14th, to be exact), but it’s not the type of picture book that lays out the primary milestones of his life and career (though a timeline at the book’s close would have made me happy, especially since I was curious to know a lot more about him after reading this). Instead, Berne gives us a vivid snapshot of Einstein’s personality as a boy and man, primarily his curious nature, his striking eagerness to learn all about the world around him. You can see some of that in the spreads shared here today, so I won’t go on about that and I’ll let the spreads speak for themselves. Berne writes lovingly and reverently about her subject matter and emphasizes Einstein’s quirks (he hated wearing socks) and passions outside of science (music, ice cream cones). She addresses his big questions (how fast light travels, magnetism, gravity, etc. — the very “secrets of the universe,” no less), showing us a person who was always deep in thought and always trying to suss out meaning from mystery. Radunsky uses gouache, pen, and ink to render the textured art, also reverent but which also goes far in showing us the humor of the man. He uses color, for one, to distinguish Einstein from others (most of the time, though none of the spreads featured here today show this), and his relaxed, carefree lines bring a compelling sense of movement to the spreads. The book closes with notes about Einstein’s thought experiments, his playfulness and sense of humor, his pacifism, the atomic bomb, his most famous equation, and recommended reading for those who want to read more. “Albert started asking questions. Questions at home. Questions at school. So many questions that some of his teachers told him he was a disruption to his class. They said he would never amount to anything unless he learned to behave like all the other students. But Albert didn’t want to be like the other students. ON A BEAM OF LIGHT: A STORY OF ALBERT EINSTEIN. Copyright © 2013 by Jennifer Berne. Illustrations copyright © 2013 by Vladimir Radunsky. Published by Chronicle Books, San Francisco. Spreads reproduced with permission of the publisher. 1) My oldest, whom I love hanging out with, turned 9 years old this week. Here’s what kicker Moira Swiatkowski noted about nine. All true. 2) My youngest mustered up every ounce of courage in her for what she found to be a very scary dentist visit. I stood there, squeezing her hand and watching her cry and brave it all, thinking: Who ever said childhood was easy? 3) Laura Marling. New song! 5) Binge-watching season two of The Killing late at night. 7) Finally going to the doctor and getting antiobiotics for what ails me. BONUS #1: I’ve pre-ordered this CD and am looking forward to its arrival in my mailbox next week. How about that first track, as well as the “Wayfaring Stranger” cover? Beautiful. Thanks, Jules, for highlighting this book. What art! I am a devoted reader of the poems of the late, great Valerie Worth, and though I lack her mastery and grace, I often try to write “small poems” of my own, attempting to give an extraordinary level of imaginative focus to an ordinary object. What a fun looking book. I will definitely look out for this one! Jules- so glad you have taken yourself to the doctor and hope you are on the mend super soon! And just a quick (but big!) kick for me. We have been looking for a slightly larger, slightly more updated home in our same school district for years and this past month, we found one! We have been knee deep in all that means and are now forging forward to get our house on the market. So exciting, stressful, happy and time consuming! So that is all for now. Hope everyone is well! A book about Einstein, must get. Love the luminosity of the illustrations. Jules, I will remember the none quote for oldest grandgirl in November. Nine? Where dors time go? Glad you’re going to the doctor. Steve, I am a huge fan of Valerie Worth. Love Rocking Chair. Stacey, congrats on finding a house. 1. Book release party event for Bridget Zinn’s book, Poison last night. So well attended…more to come on my blog. 2. Interview this week with J. Patrick Lewis. 3. Incredible poem about MLK, Jr. By JPL on Friday. We see the deepness of his talent. 4. Second graders reminder me that the Poetry Club needed photos for the school yearbook. I would have forgotten. 5. Finished Don’t Feed the Boy by Irene Latham last night. Read it. 7. Submitted over 100 student poems to the Young Poets Digest by the National Writing Project. 1) I auditioned for a film on Friday! 2) I auditioned for a film on Saturday! 3) On Tuesday, I said Veronica Mars should work with Jenna Blake. http://slayground.livejournal.com/738934.html On Wednesday, they funded the movie on Kickstarter. Coincidence? I think not. 4) I’ve received some nice feedback on my musical theatre/animated VO demo. 5) Being other people’s confidant. 6) Being moved by music and vocalists, from Matt Nathanson and Norbert Leo Butz to Lea Salonga and Liz Callaway. 7) I’m going to go catch up with one of the Imps now! Jules: Happy birthday to your awesome daughter! How are you feeling? Congrats and good luck to all of the student poets, Jone. Steven, I’d like to read every poem Valerie ever wrote. Sadly, I’ve only read a bit. Thanks for sharing your poem. I like that striking first line, in particular. Stacey, good luck! That is not a trivial undertaking. We need to do the same thing soon, and I know it’ll be worth it in the end. Jone: I saw earlier that you’d interviewed Lewis, and I am looking forward to reading that. Good luck with kick #7! Little Willow, you mover and shaker you: I’m crossing fingers for your film auditions. As for kick #6, it sounds corny to some maybe, but when music really moves me, I’m always grateful and think, good music really makes life worth living. … To answer your question, I’m FINALLY FEELING BETTER! In the midst of the flu-like thingy I had, I woke up on Wed. of last week and couldn’t move my left arm without very sharp pains. I’d HAD IT by this point (and felt like a hypochondriac), so I took myself to the doc. I had tendonitis (sp??) in my rotator cuff, and I got antibiotics for everything else. The antibiotics are helping me feel better FINALLY, and today I can move my arm without pain! YAY YAY YAY THIS! I’m gonna throw a PARTY! LW, hope the auditions provide further work. The student digest is by the National Schools Writing Project. Redunsky is one of the greatest. Aah! I meant Radunsky, of course! A sucker for anything Einstein-related so this week’s featured title, well, I’m there! Jules, SO glad you’re feeling better this week. Happy 9th to young lady #1, and congratulations to #2 on her conquest of the dragon. Also: oh jeez, I cannot believe I have never even heard of Tift Merritt until now. That “Wayfaring Stranger” — you’re right. Kinda worth the cost of the pre-ordered album all on its (poor, wayfaring) lonesome own! LW: holy cats — two film auditions back-to-back. And like you (and like Jules), vocalists can just slay me. I didn’t recognize the names you listed but will hunt them down. 4. My mom had a (minor) financial windfall this week which had us all smiling for her good fortune. Especially ’cause it came from a life insurance policy none of us knew my dad had taken out on himself before he died… 25 years ago. 5. The Pooch’s hangdog demeanor when the geese at a nearby park didn’t want to play with her, or even discuss the matter. 6. Happy birthday to My Fair Lady (opened on Broadway this past week in 1956). Spent some good time wallowing in the original cast recording and the soundtrack. Jules, thank you so much for sharing this book. It looks wonderful. :o) I hope you are feeling much, much better! OH! One of my favorites, illustrated by one of my favorites. Can’t wait to read it! Hello one and all! On Beam of Light seems like the perfect celebration for this life lived to the fullest. I like your use of the word reverent, Jules for both the narrative and the illustrations. I can’t wait to hold it in my hands. Jules: I am so glad you are feeling better. I love the peeks you give us into the lives of your girls. Steven: Your poem as always is beautiful. I finally bought a collection of Valerie Worth poems last year having been an admirer for so long. Stacey: So happy the home you’ve been looking for will be yours soon. Jone: I just read an article this morning about Bridget Zinn and her book. Little Willows: Hoping for good news on those auditions. JES: The PBS Between the Folds sounds really interesting. Thanks. Tarle: Enjoy your new class. 1. Attended the Michigan Reading Association conference last weekend meeting many virtual friends for the first time. 2. Still having plenty of wood for fires through this long winter. Happy first day of spring to everyone next week! This book looks lovely. Thanks for sharing. Jules – Glad you are on the mend. Thanks for the shout-out for nine. My boy still has a few months left of being nine and then we’ll all be double digits. Hooray for brave girls! My girl went on a week long trip this week which required much courage on both our parts. Steven – Thanks for sharing your lullaby-like poem. Stacey – Congrats on the home! Jone – Sounds like you had a lovely poem filled week. LW – I agree, no coincident. Sergio – Redunsky, Radunsky either way beautiful work. 1. Finished reading “The Tiger’s Wife”. I loved it not everyone else in my book club did though. 2. Survive a week with my girl away on a school trip. 3.-6. Finally got some time in the art studio not interrupted by storms, holidays or the taxes. Jules: I’m so glad that you’re feeling better. I was worried, and I shall remain concerned until you are 100% back to normal functionality. 😉 Music is everpresent in my life. Thanks for crossing your fingers! Jone: That is so neat. Thanks! Steven: I misspelled your name in my earlier post. Deep apologies. JES: Matt Nathanson is a modern singer/songwriter; Norbert, Lea, and Liz have all found success on Broadway and in other markets/venues. (For example, Norbert played Steve Carell’s other brother in Dan in Real Life!) Enjoy the music, if you listen to them; if forced to pick only one thing for each of them to recommend to you, I’d say Matt’s album Modern Love; Norbert’s performance as Jamie in The Last Five Years soundtrack (though I wish that had Lauren Kennedy, who played the role before it went to Broadway), Lea in Miss Saigon, which was her breakthrough – and then you’ll realize you heard her as the singing voice of Jasmine in Aladdin, and Liz as the singing voice of Anastasia in the animated musical! Hug your pup for me. Silly geese. Wow for your mom. Tarie: Hello to your new class! Margie: Thanks! Hello, as always, to Xena. I did so like Jennifer Berne’s book Calvin Can’t Fly. This one, On a Beam of Light, has such an evocative title—one which Radunky has clearly delivered on. That cover makes me want to walk outside in the sunlight and attempt to think great thoughts. ha! My guess is that kids will be similarly inspired, and that is very cool. Jules – Isn’t the actress who plays Detective Linden great? Such an unusual mix of tough/fragile. I haven’t started season two… will have to similarly binge. RE: dentist visit and childhood not being easy. Have you ever heard Daniel Handler’s riff on how odd he thinks it is that people generally characterized babies/toddlers (who burst into tears and cry hard many times a day) as “happy and carefree”. He points out that if any of us found reason to bawl our eyes out repeatedly over the short period of a day – we’d consider the experience exhausting and anything but happy and carefree. He/you have a point. Stacey – the promise of a new home, sigh. Jone – you’ve been busy! I just love that your 2nd graders reminded you. JES – the ononeon is hilariscary. And poor Pooch; shame on those haughty, dismissive geese. Tarie – Enjoy your great bunch. Margie – “dipped in powdered sugar’” – nice image. Melissa – yea for next book. RE: treasure hunt “…pretending I couldn’t see it.” ha-ha! 3. St. Patrick’s day wishes, AUDIO PLAY: in Gaelic. 4. Google’s letters dancing a jig today. 6. I second Thin Mints and add Do-si-dos. 7. full day: fun/great talk at breakfast meeting, fruitful IKEA run then coffee with Antoinette. Oh dear. Me too. Make that: Radunsky. How’d the day get away from me? I’ll be back in the a.m., promise, to read kix over coffee. I look forward to it. Sergio, I am kicking myself for not having secured art from this book to share in this very post. I wasn’t thinking. It is also scheduled to be released next month, I believe. And oh my goodness, thanks for that link in kick #1. And, yes, what you say in kick #3 makes all the sense in the world. … Poor Pooch. He tries, huh? … Also, I love your paragraph experiment. Margie, I’ll be in Chicago. I hope we can meet! Also, I’m curious: Are you still enjoying the snow, or are you ready for Spring? Moira: So glad your daughter is back with you. I hope she had fun. Thanks, LW. I’m so, SO happy to be feeling better, and I’m grateful for my general good health. Ooh, Melissa, good week (any week that involves pound cake, you know). Good news about your mother, and kick #2 made me laugh outloud. And now I wanna watch that Sendak documentary again. Also: NEW BOOK! Good news. Denise: Yes, that actress is very good. I joked with my husband that I’m not sure which character is the worst parent — Linden or Nancy Botwin. And, yes, I’ve heard Handler talk about that. Wasn’t it in The Library of the Early Mind? I’m thinking maybe it was. … LOVE kick #5. That’s gotta be fun for you. And thanks for the audio link. Very cool. Good memory Jules! Yes, DH says that bit and its included in the last 20 secs. of the Library for the Early Mind Trailer; see him at 1:54. Sigh. I despair of ever knowing enough music — or enough about music… Perhaps in the next life? Anyhow, thanks for the extra Tift Merritt sample Jules. I’ve added her new album (out tomorrow) to my to-do list for when it’s released. And Little Willow, thank YOU, too, for the heads-up about Matt Nathanson. I wasn’t that crazy about the song featured in his new video, but that Modern Love (album and single): oh, YEAH. Denise, I couldn’t quite picture that lampshade at IKEA. It seemed sorta like… well, you remember that Gunny Sack dresses fad? (Note assumption that this was strictly a thing of the past.) 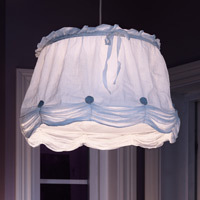 Finding that lampshade in IKEA is like finding a Gunny Sack dress in Banana Republic. John, I pre-ordered that CD, as already mentioned, and I think it will actually show up tomorrow. I’m eager to hold it and hear it again! Znacznie czarująca wiadomość. Na pewno przybędę ustalić słono. Hi Rene,Sorry to hear your picture wasn’t iucdnled. Unfortunately we only have room for 25 pictures in our gallery, and it’s possible that your shot maybe was a little fuzzy, so it didn’t make the cut. Mariela the photo gallery is designed to give a picture of what the entire event was like. We do feature video of our two winners only (you can find them in the video gallery).Looking forward to seeing you both at the next round!Brandi.